Capping a quarter century of service to California and other western states, the Western Center for Agricultural Health and Safety at UC Davis recently received a $10 million renewal grant from the National Institute for Occupational Safety and Health. The grant equips the center to continue its research, education and training efforts, with additional funds allocated for outreach and educational projects. “Agriculture remains one of the most hazardous industries in the United States, based on occupational fatality rates,” said Marc Schenker, a UC Davis distinguished professor of public health sciences and medicine and the center’s founding director. “But research and education efforts by center scientists are providing practical, state-of-the art solutions that have been widely adopted in the industry,” he said. Since its founding in 1990, the center has worked to better understand and prevent illnesses and injuries related to agriculture in the Western states of Arizona, California, Hawaii and Nevada. Some of its successes include developing real-time bioassays for pesticide exposure, ergonomically improved tools to reduce agricultural worker injuries, and a state-mandated education campaign designed to prevent heat-related illnesses among farmworkers. The renewal grant provides funding for the center to greatly expand its educational efforts through in-person, monthly seminars; on-site trainings; social media; videos; and publications on topics such as heat illness and injury prevention. 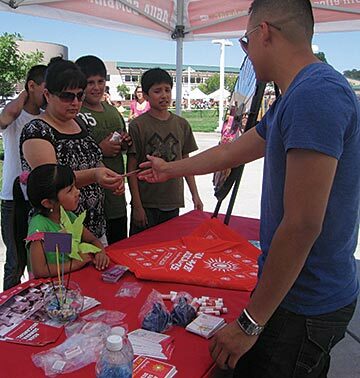 The center’s materials and programs are culturally, linguistically and educationally tailored for their specific audiences, including farmers, labor contractors, farmworkers, unions, policymakers, local and regional government representatives and agencies, agribusinesses, and nonprofit organizations. One new area of research for the center will be a project aimed at using biosolarization as an alternative to soil-pest fumigation, with the goal of reducing toxic pesticide exposure for workers. Another new research effort will focus on identifying risk factors and prevalence of workplace sexual harassment experienced by female Hispanic farmworkers. How phone apps for farm supervisors and other effective interventions can be used to reduce the risk of heat illness among farmworkers. The center, which draws on the expertise of researchers throughout many UC Davis schools and colleges, also recently launched an annual small-grants program. The program is intended to encourage development of creative research and intervention projects focused on improving agricultural health and safety.